I used to think I’d never need to know LISP. I was wrong. At first, when I accidentally overwrote my Windows hard drive with Linux, I switched between Emacs and vi a lot. All I knew about Emacs was that it took a long time to start up. Then one day while learning PGP, I came across a newsgroup post about MailCrypt, which mentioned that it integrated seamlessly with Emacs MailUserAgents, noting “You do use Emacs to read your mail, don’t you?” In fact, I didn’t, but I figured it would be worth trying, so I launched Rmail. That led to ViewMail (VM), and then Gnus. Later on, I began using EmacsIRCClient, then CalendarMode with AppointmentMode, and now I’ve all but done away with my xterm with Eshell. My X setup now consists of an Emacs window running full-screen under ratpoison, occasionally a web browser, and that’s all. 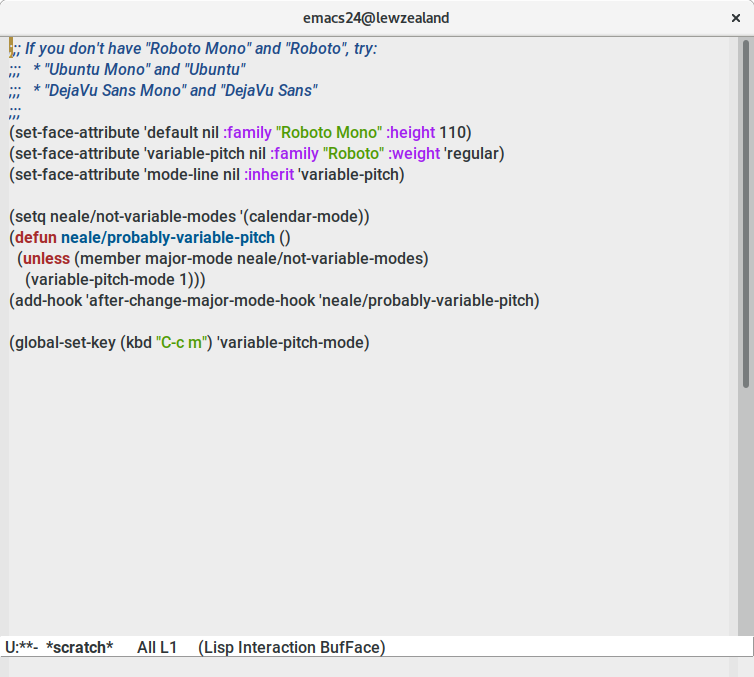 Ever since GNU Emacs 20.1 came out, I use Emacs. Before that I preferred XEmacs. Plan 9’s “Acme” editor does proportional spacing on fonts. After a few years I realized it’s actually kind of nice, so when it was time to come back to Emacs, I set up the following. There are very few editors that can handle proportional-spaced fonts. Notably, vim claims the concept is so foreign that it will probably never support it. There are occasionally things that really need monospacing, notably a lot of command-line programs. You can toggle between variable and fixed pitch with “C-c m”. ;;;   * "Ubuntu Mono" and "Ubuntu"
;;;   * "DejaVu Sans Mono" and "DejaVu Sans"
Thanks, Alex!  I’ll check the channel out.